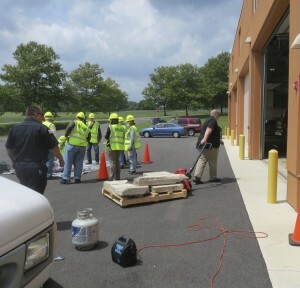 During the last CERT course, the Chester County Public Training Center was a hub of activity as emergency services workers went about their routine business as trainees learned how to rescue someone from a collapsed building. The county is inviting citizens to receive free training that will help them aid themselves, their families, and neighbors – as well as first-responders – in an emergency. Community Emergency Response Team (CERT) Training is designed to prepare residents to help themselves and others in the event of a catastrophic disaster. Because emergency services personnel will not be able to help everyone immediately, students will be trained to save lives and protect property. This class is open to anyone who wants to learn how to be better prepared before, during, and after an emergency. Teams are suggested, but individuals are also strongly encouraged to take the training to help their families and neighbors. The course, which will run from Sept. 26 to Oct. 19, will require a total of 28 hours, divided into eight sessions that will run from 6:30 to 9:30 p.m. on Tuesdays and Thursdays, with a final class on Saturday from 9 to 4. Topics will include fire safety, medical operations, light search and rescue, and disaster psychology. West Chester, 19380; emailed to jzeis@chesco.org; or faxed to 610 344-5050.